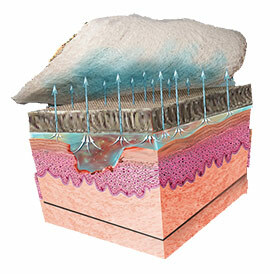 With its one piece construction and unique struts between the contact and outer layers, TheraBond 3D, enables efficient transfer of fluid and exudates away from the wound into an inexpensive outer dressing, while providing unsurpassed antimicrobial protection. Kills pathogens in 15 minutes. Provides effective barrier to pathogens for 14 days. 3D technology for efficient transfer of fluid and exudate away from the wound. Soft conformable material adapts toanatomic contours and Does not sting or stain. TheraBond 3D® Contact Dressings are used for wounds with moderate to heavy exudate. They provide antimicrobial protection for up to 14 days. 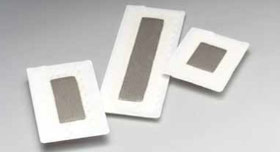 TheraBond 3D® Contact Dressings are available in many shapes and sizes to accommodate a wide variety of clinical needs. 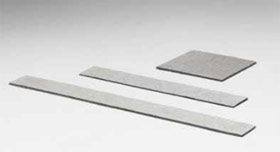 The material can be easily customized to fit a wide variety of anatomic applications. 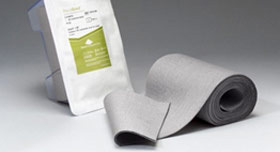 TheraBond 3D® Wraps are contact dressings configured in a bandage wrap design. They can be used on wounds where the exudate flow ranges from light to heavy. TheraBond 3D® Wraps provide antimicrobial protection for up to 14 days. They are intended to be used as contact dressing when a circumferential bandage is required for the extremities. The wrap dressings provide gentle compression. Further, they can be stapled to themselves, often avoiding the necessity for stapling to the skin. TheraBond 3D® Island Dressings are TheraBond 3D® Wraps configured into a self-adherent island dressing design. TheraBond 3D® Island Dressings are ideal for incisions that have little to no exudate. They provide a comfortable dressing that allows the patient to shower. Should you want to moisten the dressing, we recommend that you use sterile water. Saline maybe used, but the presence of chloride will decrease the amount of ionic silver available. But again, saline may be used. For best results, AME recommends sterile water. Saline is a solution comprised of sodium chloride (NaCl) and water. Silver will bond with the chloride in the solution making less ionic silver available. Using sterile water optimizes the amount of ionic silver available to kill pathogens. Secure the wrap at the top with a staple or by tucking in the flap. Cover gauze bandage with an elastic wrap bandage e.g. ACE bandage. TheraBond 3D is an advanced dressing designed to provide an antimicrobial barrier to prevent infections caused by contamination of burns, wounds, or surgical sites and to provide an optimal healing environment. What is T3D fabric technology? 3D fabric technology describes the manufacturing process that produces a three dimensional (3D) nylon fabric that has a perforated contact surface, struts that connect the contact surface to a smooth outer surface. The three dimensional structure transfers fluids and exudates away from the wound and provides thermal insulation. How does TheraBond 3D® work? TheraBond 3D is manufactured based upon two technologies: an autocatalytic/electroless manufacturing process and 3D spacer fabric. The autocatalytic/electroless technology is used to bond silver to over 99% of the fibers in the fabric. When exposed to moisture in the wound, the dressing releases ionic silver a proven antimicrobial agent. The 3D spacer technology is designed to facilitate fluid and exudate transfer away from the wound. How does TheraBond 3D® kill pathogens? When TheraBond 3D is exposed to moisture in a wound the fabric releases ionic silver. The effectiveness of ionic silver as an antimicrobial is well established. Laboratory data submitted to FDA proves that TheraBond 3D kills the pathogens commonly associated with wound infection including antibiotic resistant pathogens such as MRSA (methicillin-resistant Staph aureus) and VRE (vancomycin resistant Enterococci). How does TheraBond 3D® transfer fluids and exudates away from the wound? The dressing’s perforated contact surface takes up fluids and exudates from the surface of the wound. The fluid is actively transported by capillary action along the struts that connect the contact (wound) surface to the smooth outer surface of the dressing. Here the fluid and exudates are transferred into an absorbent outer dressing. Overall, the directional flow of this 3D delivery system is designed to maintain an ideal moist, but not wet, healing environment and to minimize the probability of the contact dressing becoming saturated. You say that TheraBond 3D® provides thermal insulation. What is the clinical benefit? The center core of the dressing is comprised of a network nylon struts that connect the contact surface to the outer surface of the dressing. Over 70%of the center core of the dressing is air. This acts as an insulator. Further, because fluid is transferred to the outer surface of the dressing, heat loss from evaporation is minimized. Minimizing heat loss reduces the patient’s metabolic energy requirement which has been shown to facilitate the healing process. Which side of TheraBond 3D® should be placed on the wound? –TheraBond 3D® provides an effective barrier against infection for fourteen (14) days. NOTE: The results of these tests are summarized here (show the two tables in the product literature to your customer). To show that TheraBond 3D® effectively kills pathogens commonly associated with infection we used a representative sample of Gram positive and Gram negative bacteria as well as spore forming and non spore forming fungi. TheraBond 3D was challenged with an infectious dose (greater than 105 [ten to the fifth] colony forming units) of each organism. In all cases there was at least a four log (104[ten to the fourth]) reduction of bacteria. Does TheraBond 3D® adhere to the wound? Like any porous dressing, TheraBond 3D will adhere to wounds especially those rich in fibrin exudate. Sometimes adherence offers a clinical benefit, such as in partial thickness injuries and donor sites where adherence will provide comfort for the patient. When used in these clinical applications, TheraBond® should be left in place until the wound heals. Leaving the dressing in place prevents disruption of the re-epitheliazation and promotes patient comfort. When the wound is healed, TheraBond will release spontaneously. In applications where the clinician may want to observe the wound frequently, adherence would interfere with the clinical objectives. In these cases, a non-adherent dressing, such as Meplitel, should be applied as a contact layer. If the bandage has a foul odor, is that a sign of infection and should the dressing be changed? If there is a foul odor but no other symptoms of infection such as fever or malaise, it is highly unlikely that the wound has become infected. The odor is a result of denatured proteins (------) that accumulate as part of the healing process. If the odor is intolerable, the dressing should be changed. How should I moisten TheraBond 3D®? If there is a sufficient amount of exudate associated with the patients burn, there is no need to pre-moisten the TheraBond 3D. The fluid in the exudate will be sufficient to activate the dressing. In fact, the insatiable loss is sufficient to activate the dressing.